It is fitting that today’s Obscure Classic Rock band shares its namesake with a particular above-ground plant organ that will get a lot of attention over the upcoming weeks in New York. Fall foliage is gorgeous, until the colorful palette of leaves tumble to the ground and leave the trees barren, and the yard full of crunchy, multi-colored nuisances. Unless, of course, you enjoy the monotonous task of raking leaves. If that is so, Fall is your type of season. Anyway, if you have not guessed, the band that I will be profiling today is The Leaves, a mid-60s garage-rock from California. Last week I profiled the Seeds, another garage-rock act from Los Angeles. From the Seeds to the Leaves to the…what other botany-based 60s band will I come up with. The Leaves were formed in 1963 by bassist Jim Pons while he was a student at Cal State Northridge in LA. Originally called the Rockwells, the Leaves developed their new name from a response the band heard to the typical 60s greeting “what’s happening.” The response was, “the leaves are happening” and the Leaves stuck. Pons was joined in the band by John Beck (vocalist), Bill Rinehart (lead guitar, replaced by Bobby Arlin), Tom Ray and Robert Lee Reiner. The Leaves began playing surf/dance rock and played their first show at a school gymnasium with Captain Beefheart and His Magic Band, thereby marking another fantastic concert at a school gym performed by awesome 60s musicians. After the Byrds left their residency at Ciro’s on the Sunset Strip, which was a rock n’ roll club in the 60s, The Leaves replaced them and were there discovered by singer/actor Pat Boone who got them a record contract. Before I start talking about the song above, I’d like to talk about “Hey Joe” and the rest of the history of the band. Obviously, “Hey Joe” is most recognized as a Jimi Hendrix distored, hard-rock song; one of his guitar saturated pieces that oozes with emotion and pure awesomeness. But I do feel like many do not know that the song was not initially presented in its rock n’ roll form by Hendrix. (The song does have a history which I am not going to discuss in this post – stay tuned for a future history). The first version was The Leaves’ gritty, fuzzy, stripped down, developed version. 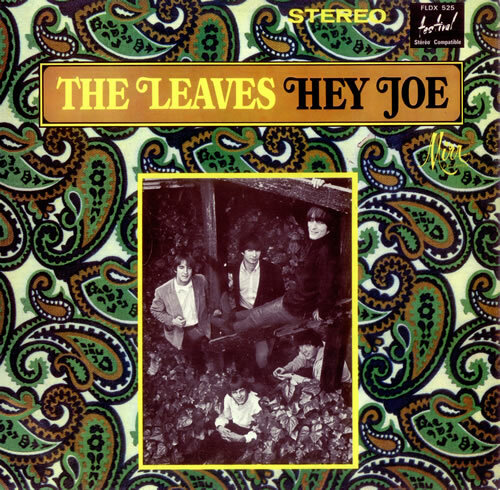 The Leaves were a young band and “Hey Joe” was their tour de force. The song was initially released in 1965, but it was pulled back by the band because it was unsatisfactory. Then it was released again in 1966 and that recording flopped. It was not until original guitarist Bill Rinehart left and new guitarist Bobby Arlin experimented with a fuzztone, that the song became popular, a #1 hit in LA (#31 on Billboard). The band broke up in 1967. Arlin went on to form the psychedelic band The Hook and Pons joined the Turtles. In 1970, the band reunited for a year and then broke up again. Pons also played in the Mothers of Invention before becoming a video director for the New York Jets in 1973. He retired in 2000 and moved down to Jacksonville where he now does game-day video for the Jaguars and plays stand-up bass in a bluegrass gospel band called Deep Creek. Let’s listen to the songs. “Too Many People” is clearly Beatle-inspired. It is a good example of repetitive garage rock. A constant riff, vocal melody, and a harmonica. Mix this with screaming fans and you have got yourself a mid-60s rock band. “Hey Joe” is just, well, different. The fuzzbox immediately screams a more mature form of garage rock, an improvement to the buzzing sound that became synonymous with garage rock. The song is packed with emotion, solid bass work and an enjoyable guitar. It is the rock original and it is important to recognize it as such. Great to see recognition of the Leaves. Mind boggling that you site a Jacksonville newspaper yet neglect to site the wiki article (found here: http://en.wikipedia.org/wiki/The_Leaves) from which you cut and paste about three quarters of your “profile”. Lame. Actually I got some of my information from here (http://www.oldies.com/artist-biography/The-Leaves.html). The rest of it I knew from a book I have on old bands. If those who wrote the Wikipedia article took from these sources that’s not my problem. And I linked to the article just in case anyone was interested in the whereabouts of Jim Pons. I thought there was more to that article and I wasn’t going to just copy and paste it into the article. I appreciate your comment but dislike your accusation – especially when it isn’t true.